In 2014 best advice we could give to someone is to start part time job or part time business. Well many of you may not dissolve with this idea because you might be feeling that starting part time business or job means time away from family more work more stress etc. But believe me this part time job or business can create huge potential for better life. Well we will not discuss about what business or job you should adopt, that is entirely up to you but we are here with strong reasons why you should start part time job or part time business in 2014. Part time job or part time business can give you additional future income security. You are going to make extra money (second source of Income). This extra income will surely help you in bad times or in time when you lose your primary income source/job. As part time job or business brings extra money, you have more money at disposal. It increases your purchasing power and you can enjoy better life style. It’s always joyful to live better lifestyle. If your monthly spending stays the same after you opt for part time business or part time job then you will have additional money to save and invest. This investment can bring more return and you can fulfill your retirement goal early. With extra money you can even think to pay off your mortgage to stay debt free. 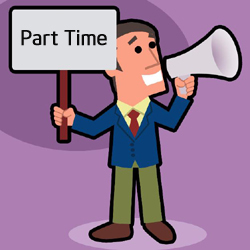 Having something part-time is a learning experience that will benefit you down the road. Part time job or business can bring additional skills to make you future ready. Part time sales job can be stepping stone for future business. You can have chance to become full time businessman. This reminds me to popular saying by “Robert Kiyosaki – Mind your own Business”. This year, ask yourself this, “Have I been working hard and making everyone else rich?” if yes time has come to make yourself rich by starting something own. Build part time business and grow your business so that you can transit from part time business owner to full time entrepreneur. Suppose if you are not doing part time job or business. What is your favorite pass time? Majority of people will say entertainment, TV, food etc. So ultimately you are consumer if you are not doing anything. If you opt for part time job or part time business you can become producer as you are utilizing extra time to earn more money. So what are you waiting for start your part time job or business in 2015.